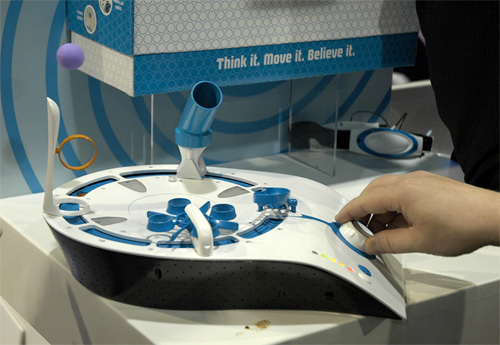 [CES 2009] Mattel's Mindflex Game | OhGizmo! Mattel brought a decent collection of high-tech games and toys to CES this year, but it was their Mindflex that seemed to be drawing the biggest crowds. It’s another “mind-control” game where your thoughts are used to move a ball through an obstacle course, or at least that’s how it’s made to appear. 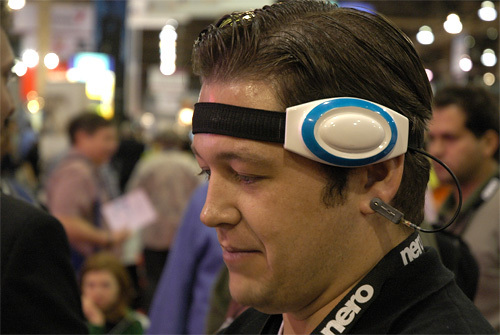 Obviously we haven’t quite mastered the subtleties of mind-control just yet, so the Mindflex uses a headset with a couple of earlobe clips to measure the theta-wave activity in your brain, which is related to your level of concentration. The ball appears to levitate thanks to the clever use of a fan, but the speed of the fan is directly controlled by your brain activity as measured by the aforementioned headgear. Given it was my fifth or sixth day in Vegas, I opted not to try the game since I was already brain dead, but those who did give it a whirl were prompted to concentrate on anything they could think of in order to get the ball to float higher. However, your thoughts only control the vertical movement of the ball, and in order to get it around the obstacle course you also had to use a large dial to adjust the position of the fan. Overall I’d have to say the game came across as an expensive $80 novelty more than anything, but you’re welcome to try it for yourself and come to your own conclusions when it goes on sale sometime in the Fall of this year. Reminds me of the Harry Potter Winguardium Leviousa training game put out a few years back.